Before the introduction of fully mechanised farming equipment, the men and women of the lowlands fought a constant battle against the elements. Life was a daily struggle to make ends meet and the farm lands upon which they worked were constantly threatened with being reclaimed by the sea. 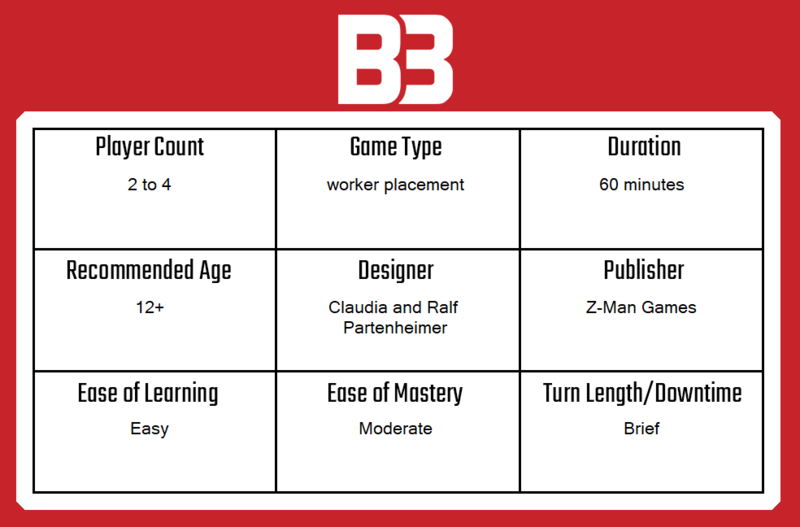 In the board game Lowlands, players recreate this struggle in the form of a quick, accessible, worker-placement game. Lowlands is a wonderfully simple game which takes a single, focussed theme and links it to two key gameplay considerations. It offers players a modest handful of core actions and makes sure that turns are straightforward, fast and rewarding. 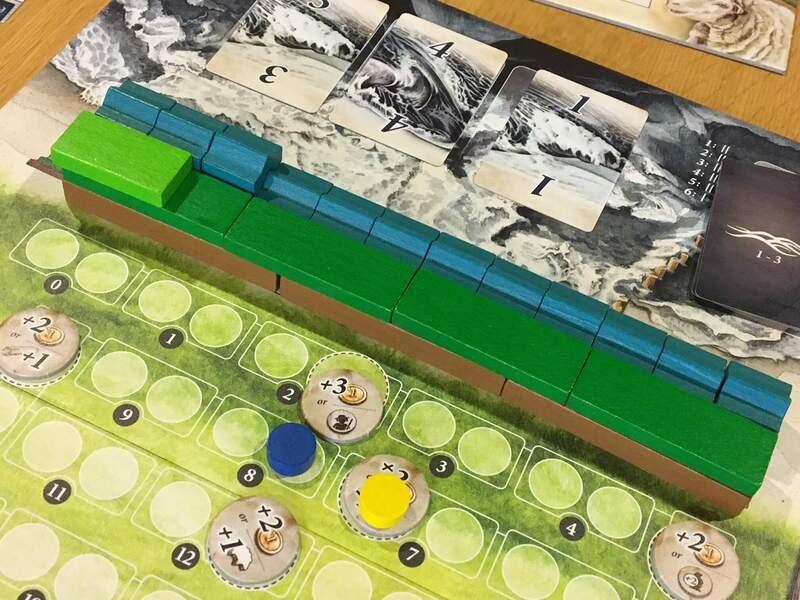 Between two and four players can enjoy Lowlands and in my experience, it’s a very different prospect at these different counts thanks to the way in which the scaling elements happen — primarily in relation to how fast contributions to the dike can manifest as completed sections. Lowlands is essentially a worker-placement and action-selection game, although because actions are taken on an individual player board (your own farm) there is never any contention for spaces. If you want to access a shared market board, for example, you place one of your farmer meeples onto your board, rather than the market itself. Instead of forcing competition for space, Lowlands introduces the absolutely beautiful feature of having a shared objective, which is to contribute towards a system of dykes that must remain above sea level, lest all players suffer the consequences. Essentially a game about collecting victory points, each player builds up their own farm, expands their flock of sheep and works to ensure the dyke holds. The player with the most victory points at the end of three rounds of worker placement, flooding and scoring wins the game. This finite countdown to a conclusion is tracked on the main board and the game is exceptional about reminding players of its structure, which helps to make Lowlands quite a quick game, despite the satisfying strategic planning and need for tactical decisions. The components in Lowlands are somewhere between good and great, which depends entirely on your perspective of the fairly low-key, water-colour artwork. In pure quality terms, nothing is out of place here; the boards are all of excellent quality and, like it or not, the artwork is thematic. There’s a lot of card stock for things like building tiles and tokens, all of which meet at least the expected standard. The bulk of what might impress players in terms of component quality, though, is the amount of wood included. There are almost a hundred sheeples (yes, I went there), along with four large, wooden farmers for each player. There are sixteen wooden fences per player and then, perhaps most impressive of all, three different kinds of piece to represent the dyke, as well as a bagful of sea pieces that actually stack into three rows to show the rising water level. There’s a lot of other stuff in the box as well, from the rather-well-produced flood cards to the tiny wooden houses that are placed as farms expand — it’s all excellent. What I think deserves the most praise, though, is the instruction manual. It’s about ten pages long (at most) and contains perhaps six pages of actual rules, which are delivered quickly and easily with clear examples. I learned to play Lowlands directly from the manual in less than thirty minutes and I’ve taught it from memory three or four times now. Despite the number of components, it’s a wonderfully simple game that prioritises common sense above all else, which I really love. Turns in Lowlands are so straightforward that I am just about bound to get them wrong by over-explaining them. At the beginning of the game, three tide cards are drawn and placed face down on the board. At the beginning of the first turn, the players turn over the first card and add the number of tide pieces shown on the card. They then take it in turns to play each of three farmers onto their own farmyard board, each of which is stickered with a number from two to four. Each action has a value associated with it in effort, from one to four, with each fence placed being one effort, for example — or some of the more powerful buildings costing the full four actions. Any residual actions that a particularly industrious farmer might create can then be used to draw resource cards from the board or straight off the top of a deck. There are only really five actions to choose from, which include building, contributing to the dyke, placing fences, buying or selling sheep and drawing resource cards. At the end of the work phase, there is an upkeep phase which involves drawing one resource card as a minimum, with coins, labourers and further resource cards introduced as the result of placing fences and buildings from your own personal supply. A total of three work phases and two upkeep phases take place, with a tide card being resolved in between each of them. At the end of the third work phase is the Storm Surge, which acts like a scoring round, albeit with the addition of a tracker that incentivises players to change their focus based on the state of the dyke compared to the rising water level. At the end of the third round of scoring, the game concludes. The player who has the most victory points — counted among sheep, buildings, contribution to the dyke and wealth — is the outright winner. There are a few minor nuances that I haven’t mentioned in detail — such as the labourer tokens which add an action to a space that also has a farmer on it, or how dyke break tokens penalise the player who has contributed least — but the basic premise of the game is very simple indeed. Lowlands is possibly my favourite worker-placement game, as of right now. That may be quite a bold statement, but it really is an excellent game and I think it really deserves the praise. For starters, it has a very focussed theme that might seem a bit odd or niche, but because of how closely it links with the mechanical elements that underpin it, it just works. 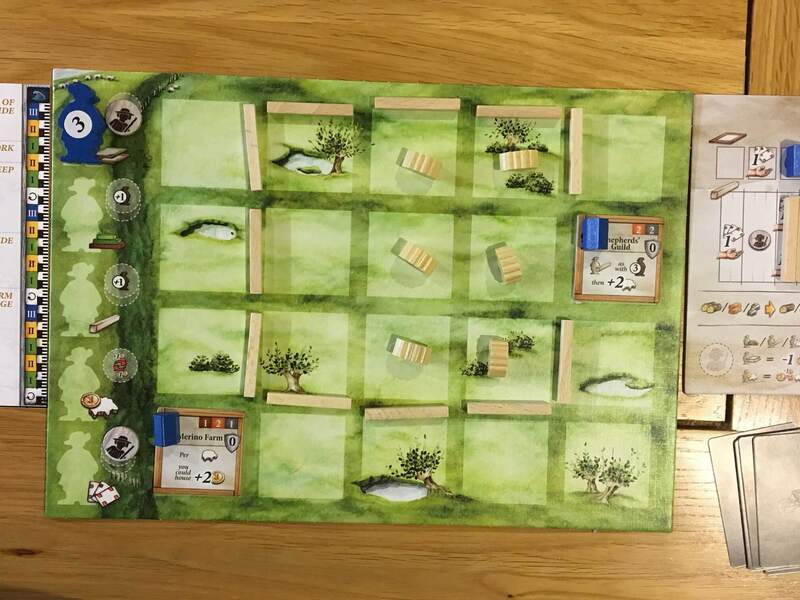 The players are all sheep farmers, so their intention is to expand their farm, secure it with fences and add sheep to the flock. More sheep need more space, they breed and for maximum value, you can sheer them or make cheese from their milk. That’s all very simple and normal. But what about the sea level? Well, that’s Lowlands‘ real point of differentiation, because if the sea level rises and the dyke is deemed to be unfit during the storm surge round, the value of sheep falls and the cost of working on the dyke increases. If the dyke is secure, however, everyone benefits (including all the farmers that exist in this world, but not in your game) so the value of sheep goes down. With each round of play, the effort needed to secure the dike increases as well, which means that players are constantly challenged to reassess their priorities. Whilst you might think that a game with a potentially complex choice like that might bog down into analysis paralysis, it sort of doesn’t matter, because even if a player takes a moment to think about their turn, actually executing any action takes about ten seconds, max. Lowlands is a super-quick game when you consider that it has a fair number of chunky actions embedded within it, which I think is not just uncommon — it’s almost non-existent among heavier worker-placement games. The simplicity of play and the way it aligns so closely to both theme and common sense are what make Lowlands so, so straightforward to play, especially when supported by such a succinct, clear instruction book. You’ll never struggle to find a rule or have a problem interpreting what happens in a given scenario and even if you do, it’s easy to make a judgement based on sensible logic. 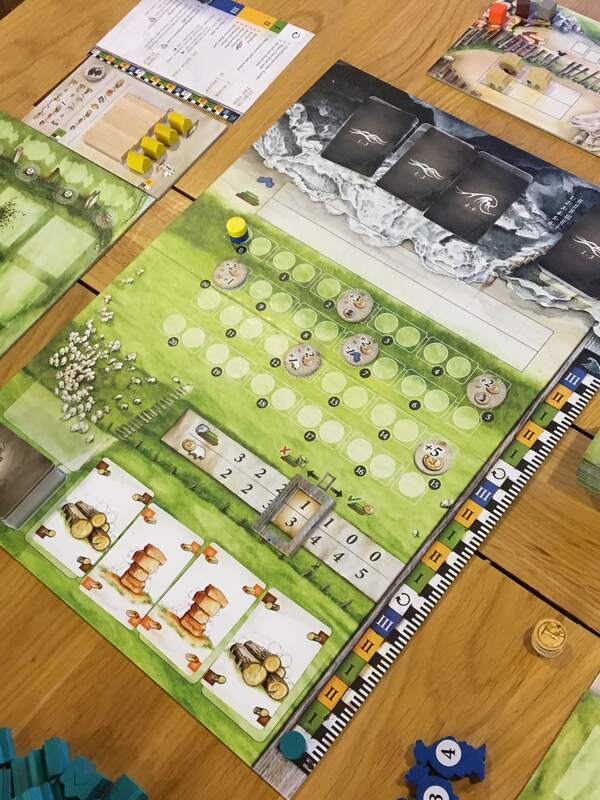 You may not have cared about sheep farming before you start playing, but I’d challenge anyone not to be fairly hooked on the idea by the end of their first game of Lowlands. What more can I say, really? Lowlands is an incredibly easy-to-learn and simple-to-teach game that hits the sweet spot between accessibility and depth right on the bullseye. It is fast and free flowing, with simple mechanics that make both thematic and logical sense, which leads to a feeling of both individual and shared accomplishment between the players, depending on the outcome. I don’t think that there has ever been a better game to use when making the step from true gateway games into more complex euros. If anything, you’ll need to warn your players that not all the games they will play from there on out will be as good. I think Lowlands is a superb addition to any collection and I’ll certainly be playing it for many months to come. It’s a very solid design, made even more impressive because it is from a debutante design team — bravo. 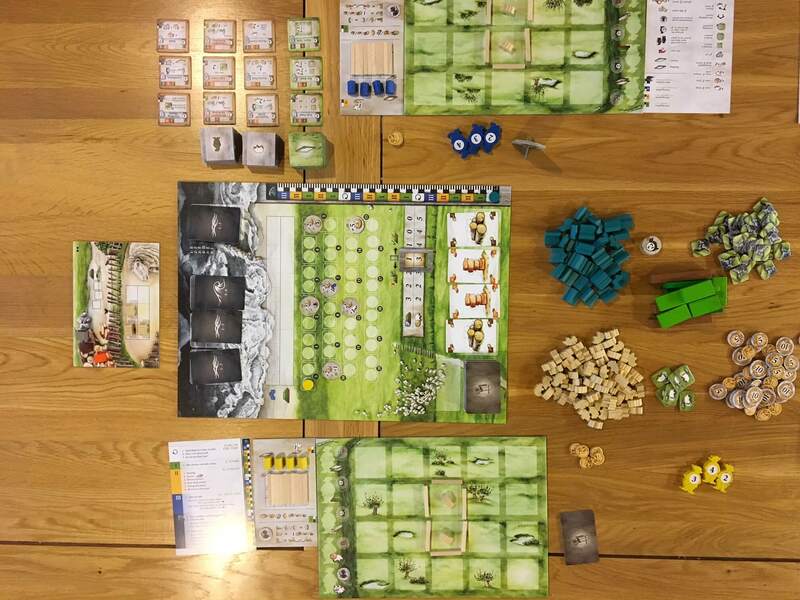 A copy of Lowlandswas provided for review purposes, and can be purchased from all good local games stores. For online purchases, please visit 365 Games.